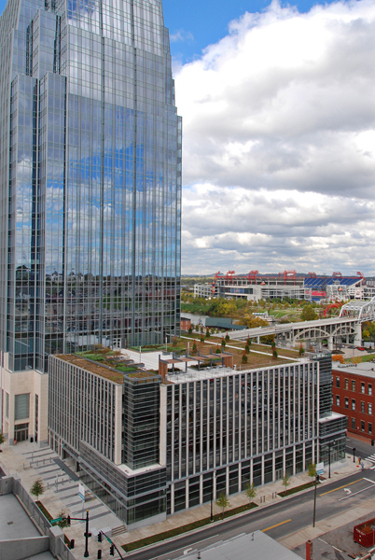 The green roof, designed by our office, is located on the 7th floor above the parking garage and includes a series of spaces that can be enjoyed by the building’s tenants. The area is comprised of 9,400sf of pedestal pavers and 19,000sf of vegetated areas. One hundred percent (100%) of the pavers were selected to exceed the minimum solar reflectance standards established by the LEED rating system. The striping pattern continues the prominent vertical fins on the facade of the building into the rooftop garden area. 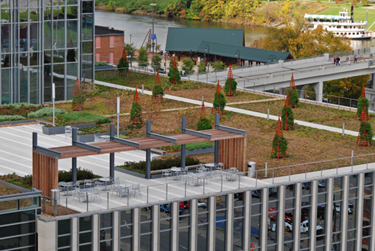 The planting areas are a combination of extensive green roof (planting media depths ranging between 5-9”) and semi-intensive areas (planting media depths ranging between 18”-30”). The semi-intensive areas were planted to reflect a more traditional landscape around each of the gathering areas and provide areas for trees to shade and scale the spaces. In an effort to establish a more pedestrian scaled environment and additional interest a series of 12ft pyramidal trellis structures were incorporated in the extensive green roof areas. 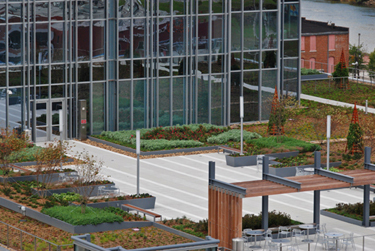 It is estimated that the green roof can retain nearly 67% of the annual rainfall falling directly on it. In addition, it reduces the peak flows, is significantly cooler than neighboring conventional roofs, reduces thermal heat gains in the water that enters the stormwater system, and provides a beautiful space to look upon and enjoy. We are honored to have been a part of such an exciting project and look forward to watching it grow. We have been pleasantly surprised by the significant growth the plant material has shown in a short time period. As it matures, we will keep you up to date on its progress. Over the past decade, cities have utilized a variety of methods to encourage and/or require sustainable building practices within their jurisdictions. All across the country green building incentives were enacted. According to a recent AIA Survey, 138 cities have some form of green building programs. Methods that rely on density bonuses or tax increment financing to reward/incentivize developers were predicated on growth. Unfortunately, the building boom over the last three to five years has fizzled (for the time being at least). It is no secret the development landscape has changed. Obviously, fewer projects being built equals less opportunities to incorporate green infrastructure within our landscapes. This really isn’t a problem if a project was being built in a greenfield. In fact, on a number levels especially in regards to stormwater management and water quality, it is preferable. But for the greyfields and brownfield sites that comprise much of our urban landscape, it is opportunity delayed. The opportunity being to convert these sites to better use and mitigate their negative impact. The old parking lots and retail centers continue to absorb and radiate heat while directing polluted stormwater into overburdened infrastructure and streams. This is particularly acute in areas that were built prior to modern stormwater standards. So what are cities doing to encourage the incorporation of green infrastructure under these new market realities? Stormwater Fees. Realizing that general funds can no longer meet the demands imposed on cities by the Federal Government and State Agencies, many cities have or are relying heavily on stormwater fees. Typically these fees are applied to everyone’s property based on impervious surfaces. It is common under these programs for property owners to receive discounts through the use of various stormwater management strategies. These often include green infrastructure related tools (i.e. green roofs, bioretention areas, pervious pavements). Depending on the significance of the fees, this can be a deciding factor for property owners to retrofit their properties. However, in most cases they are not high enough to warrant major investments. Dedicated Funding. The City of Portland has taken a page from the art world and have enacted a “One Percent for Green” program that works similar to the more common “Percent for Art” programs. 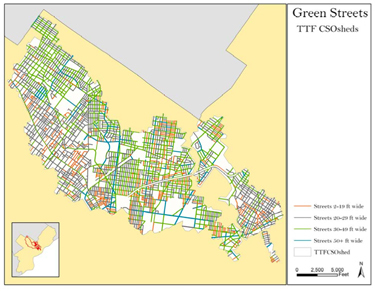 It is funded by allocating one percent of the city’s construction budget for the purpose of building green streets both on public and private property as long as it treats public stormwater. It also includes any new and retrofit projects that wouldn’t trigger the Stormwater Management Manual. Economy of Scale. 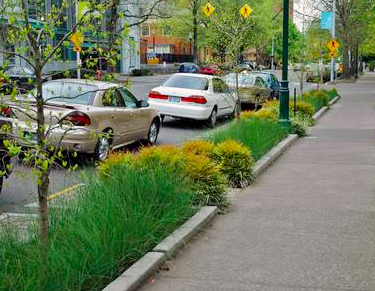 The unique double functioning nature and triple bottom line benefits of green infrastructure has prompted cities to combine stormwater management with other projects such as parks, streetscapes, road improvements, and other capital projects. The economy of scale allows them to stretch their dollars further to meet the needs of the city. Direct Reimbursement. As mentioned in an earlier post about Chicago’s green roof program, cities are offering direct reimbursement of installing green infrastructure. This has manifested itself mainly for constructing green roofs. These reimbursements typically run around $5 per sf. Depending on the situation this can reduce the square foot cost for a green roof by as much as 30%. Clean Water State Revolving Fund (CWSRF). CWSR Funds are another useful tool offered by each individual state that municipalities are utilizing to fund green infrastructure projects. Funding is provided by a combination of EPA grants and State matching funds. The basic premise is the fund provides low interest loans to municipalities for wastewater treatment, stormwater management, nonpoint source abatement and estuary protection projects. The payments toward the loan are reincorporated back into the fund where they can be loaned again. This method is increasingly becoming popular as a means of implementing green infrastructure projects across the country. The 2009 Stimulus Plan (American Recovery and Reinvestment Act, ARRA) gave a considerable boost to these programs. It includes $4 billion for Clean Water State Revolving Fund projects and $2 billion for Drinking Water State Revolving Fund projects. Together programs like these have enabled municipalities to continue investment in their stormwater infrastructure. As cities grapple with the current market conditions, we should expect to see new creative funding ideas and a continued commitment toward increasing the use of green infrastructure throughout our cities. Comments : Comments Off on Opportunity Delayed? The Middle Tennessee Chapter of the American Society of Landscape Architecture recently presented Hawkins Partners, Inc. a 2009 Honor Award in the environmental/urban design category for its work on the Hill Center in Green Hills. HPI was involved in the planning, design, and construction of this infill redevelopment project located in Green Hills. The 220,000 s.f. mixed-use development consists of retail, restaurant, and office space. Site design elements include a pedestrian activated streetscape, which consists of wide sidewalks for shoppers, places for people to sit and relax or visit with friends, and outdoor dining along a tree-lined boulevard. Sustainability played a big role in the design process. HPI collaborated with the design team to provide 100% improvement in the stormwater treatment over the previous site conditions. The site captures rainwater in a 25,000 gallon underground tank for use in irrigating the landscape (comprised primarily of native plants), and also utilizes new bioretention areas, which slow and reduce runoff – ultimately helping lower the temperature of runoff into the nearby Sugartree Creek. Some other items include a white roof on the Whole Foods store, over 60% of the parking is provided by covered structures and all the site lighting utilizes cut-off luminaires to reduce light pollution. This project also won the Excellence in Development Award presented by Urban Land Institute (ULI). I got the chance to spend a little bit of time last week with Chicago’s firecracker Commissioner of Environment, Suzanne Malec-McKenna while she was in Nashville for the Nashville Civic Design Centers annual Plan of Nashville event. Suzanne has been in the middle of an astonishing number of Chicago’s environmental bright spots, including the ambitious Chicago Climate Action Plan released in 2008, Chicago Trees Initiative and the very cool Chicago Offset Fund. But what has impressed me the most (and has for a long time) is Chicago’s tremendous growth in green roofs. It all started in 2001 with the now well-known Chicago City Hall roof weighing in at a modest 20,000 s.f. In June 2008, a short seven years later, Chicago boasted 4,000,000 s.f. of green roof and today, they report that they have hit 7 million s.f. and they are still going. I wanted to find out more about how such an explosion occurs and one of the pieces and parts is related to the success of the green roofs is a Green Roof Grant Program begun in 2005 which has been continued and expanded. An interesting side note is that the popularity and volume of the green roofs across Chicago has also reduced the average installation price of extensive green roof in Chicago has dropped from $25/s.f. to $15/s.f. As if the incentives of grant incentives aren’t enough, I also noticed that in August 2009, the Illinois Energy Plan provides ARRA funds toward cost-effective energy projects, including green roofs, which meet certain criteria. Illinois has recognized that green roofs provide economic development, carbon capture and energy and maintenance cost savings. As I looked around at other cities, I found a few more that were engaged in similar incentive programs introduced within the last year: Portland, New York City and Washington DC (List of green roof incentive programs) . Through tax abatement or grants, each of these cities provide an incentive of about $5.00 per square foot through a green roof review process. Portland expects their Grey to Green Program to their current nine acres of green roofs on about 90 buildings to increase over the next five years by another 43 acres. Portland is committing $300,000 in grants in its first fiscal year of the program and is committed to keeping the program going for at least the next five years. In our neighbor to the north, Toronto started the green roof incentives in 2006 starting with a $10 per square meter subsidy, then raised the subsidy amount to $50 per square meter in order to be more effective. Reports are that funding of $2.4 million dollars for green roof subsidies have been approved for the first five years of the program. So hats off, Chicago! You are serving as a great example for the rest of North America – in fact, Chicago topped the Green Roofs for Healthy Cities list of top ten cities for both the United States and North America for the past five years.